Fruit, paper ornaments and flowers were used to decorate the first Christmas trees. Today we have electric lights, blown glass ornaments, and all kinds of beautiful decorations you can buy for your tree, but the ornaments and decorations that stand out are the ones that are made at home. Making decorations is a tradition in my family, and I want to share that tradition with you. I have always enjoyed making popcorn strings. Always use unbuttered popcorn, and just use a regular thread and needle. I also recommend that you keep them to a manageable length, like three feet or so. One fun trick my sister came up with was to toss the popped corn in red or green food coloring. You can also toss it with glitter to add some sparkle. Another way to decorate and be creative is with salt dough. It can be colored, painted and glued, and it is very malleable. After mixing the dough, you can roll or cut it into different shapes which, after baking, can be painted with acrylic or poster paints, and further decorated with glitter, glued-on rhinestones or other whatever suits you. Mix the water and salt and let sit for a minute or so to allow some of the salt to dissolve. In the bowl of an electric mixer, slowly add the flour to the salt water, and mix all together until smooth and pliable. Cover the dough with plastic wrap and let rest for about 5 minutes. Roll out to a 3/4-inch thickness on a floured surface and cut into shapes with cookie cutters. Place the "cookies" on a non-stick baking sheet and bake in a 300-degree oven for an hour. Remember, you do not want them too dark in color or it could interfere with the decorating of the "cookies". Let the "cookies" cool completely. Then paint and decorate them as you like. Makes about 2 dozen pieces, but please do not eat these! Gingerbread houses are very popular during the holidays. It is possible to buy a kit from the grocery store or craft stores like Michaels. These kits include pre-baked walls and roofs, icing that you just add water to, the candy and the pastry bag with a star tip. They take about one hour to assemble, and they look great, but you miss out on all the fun of creating your own. 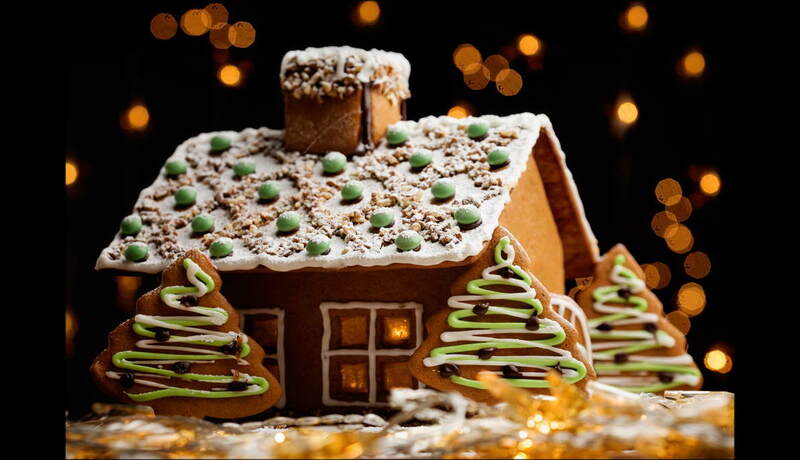 You can make you own gingerbread house from scratch, enjoy doing it and accept all the compliments. It's just a matter of how much time you have. Preheat oven to 325°F degrees. Line several cookie sheets with aluminum foil. Butter and flour the foil. Using the dimensions in the Gingerbread House Drawing, cut out paper patterns for the walls, roof and chimney, and set aside. In a large bowl, cream the butter and sugars. Beat in the molasses and eggs. In another large bowl, sift dry ingredients. Combine mixtures and knead into a smooth ball. Cover and refrigerate at least 30 minutes. On a well-floured surface, roll out a small amount of the dough until it is 1/4 inch thick. Place one of the paper pattern pieces on the dough and cut around the edges. Gently, using the spatula, lift the dough and place it on the foil-lined, prepared cookie sheet. Bake for 15 to 20 minutes or until slightly firm. Let cool on racks until firm enough to handle. Peel the foil off the sections and set the pieces aside to dry thoroughly overnight. To make windows and the door: Cut out a rectangle for the door and squares for the windows from the appropriate side. Cut the window in half to make shutters. If you're feeling ambitious, fill the empty windows with crushed lifesavers to form "stained glass" windows. Or, instead of actually cutting out the door and window(s), just score them and decorate appropriately for a closed-door effect. To make the chimney: Cut out a rectangle big enough to hold all pieces of the chimney. When the baked dough is still warm and soft, lay the patterns on top and cut out the pieces. This recipe is for a single batch. You will probably need several, but if you make them all at once, keep them in separate bowls. Royal Icing dries very quickly and is like cement. Keep it well covered: one piece of plastic wrap touching the icing itself and another over the top of the bowl. In a large bowl, beat the egg whites until they begin to foam. Add the cream of tartar and beat until the whites are stiff but not dry. Gradually beat in the confectioners sugar, beating for about 5 minutes until it reaches spreading consistency. Keep it covered and refrigerated until needed. Pipe out the icing on the bottom and one end of one long wall and one short, put them together at a 90-degree angle, and hold them in place on cardboard with cans. Repeat with the remaining two walls, running a line of icing glue along the corners so that all the walls are glued together. Again hold walls in place until icing is dry. Let the roofless house dry at least 30 minutes until the icing is firmly set. Run a thick line of icing along one long side of a roof piece. Stick the two roof sections together at an angle and set the two pieces on top of the house. Make sure that the roof overhang is the same at both ends of the house, although it is okay if it isn't perfect. Hold the roof gently in place until it dries (the pop cans should be the right height to support them). Let dry for half an hour. While the roof is drying, attach the door to the doorway by running a line of icing glue down one side and along the base. Make sure the door is open wide enough to slide a small glow stick inside later (so you can appreciate the stained glass windows). To attach the chimney, on one side of the roof near the peak, glue one angled piece to the roof. Glue the largest rectangle to the angled piece and then glue the second angled piece in place. Last, glue the smallest rectangle to the other sections. Hide any mistakes under a "snow" of icing. If the pieces aren't exactly even and don't come together with exact precision, don't worry. Major differences can be filed down and smoothed out with sandpaper, and the Royal Icing can act as a filler. Let the house dry until completely solid, preferably overnight. Then you can decorate with a variety of candies in any way you like! And you're guaranteed to have fun!